My latest complete site is for this wonderful, talented sign designer. 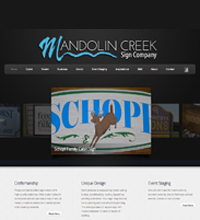 If I ever need a sandblasted sign, I’m going with Mandolin Creek! Take a look at the full site.